Free Shipping Included! iPhone 6/6s/8/7 Battery Case, Guojia 5500mAh Extended Slim Rechargeable External Battery Portable Power Charger Protective Charging Case for Apple iPhone 6/6s/8/7 (4.7 Inch)-High-Capacity-Red by Guojia at DJ Luu. MPN: BJ-6-RED-T. Hurry! Limited time offer. Offer valid only while supplies last. 【Sliding lens protection】: We designed a slide plate on the camera lens. It can cover iPhone camera lens and protect lens very well. 【LONG BATTERY LIFE】: 5500 mAh powerful rechargeable protective portable charging case for your iPhone 6/6s/7/8, up to 200% standard battery provide an extra 130 hours standby, 12.5 hours talk time, 8.5 hours video, 10 hours web browsing or 8 hours gaming to your Phone. 【INNER SAFEGUARD & PHYSICAL PROTECTION】Certificated by CE, FC and RoHS. The inner smart security chip protects your iPhone against short-circuiting, overheating or over-charging. 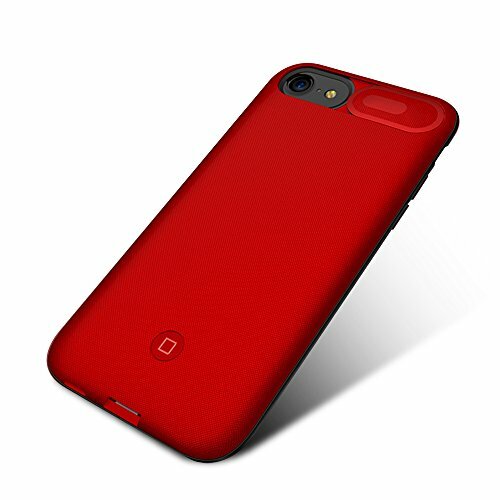 [SHOCK-ABORPTION]Wrapped with soft TPU material, cushion impact once your iPhone drop accidently. View More In Battery Charger Cases. If you have any questions about this product by Guojia, contact us by completing and submitting the form below. If you are looking for a specif part number, please include it with your message.